Need a quick, simple meal to feed your hungry family? This Hamburger Casserole has four ingredients. Perfect for getting food on the table fast! At the risk of sounding like a broken record, my hubby is rather picky about the food that is on his plate. Vegetables are forbidden, save potatoes and green beans (canned from a garden is preferred). Let’s not even talk about carrots. Good thing he likes this Hamburger Casserole. Finding a favorite meal is easy if I make a meat and potatoes dish. Unfortunately, hamburger is costing the same as a small diamond around our area. Therefore, we aren’t wanting to use a lot of red meat in our cooking to save a few dollars. The other day, I was feeling creative and wanting something cheesy. Who doesn’t enjoy a casserole with a layer of cheese on top? 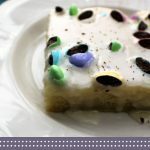 I wanted to use a few ingredients as possible and use ingredients that would please the family. This hamburger casserole was born. It has a simple, easy ingredients that come together in a snap. The meal only cost us around $8. Now, that may seem like a lot. However, our son and my hubby took it in their lunch for the next couple of days. 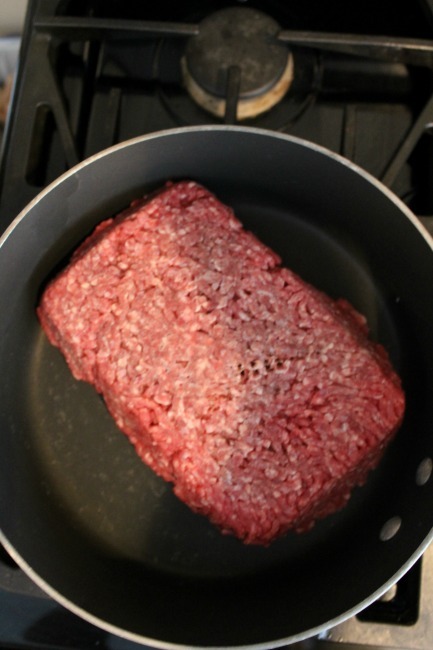 Simply fry up the hamburger. This meal really comes together quickly when you have hamburger already cooked and in the freezer. The next step is to boil the noodles in a pot of boiling water. 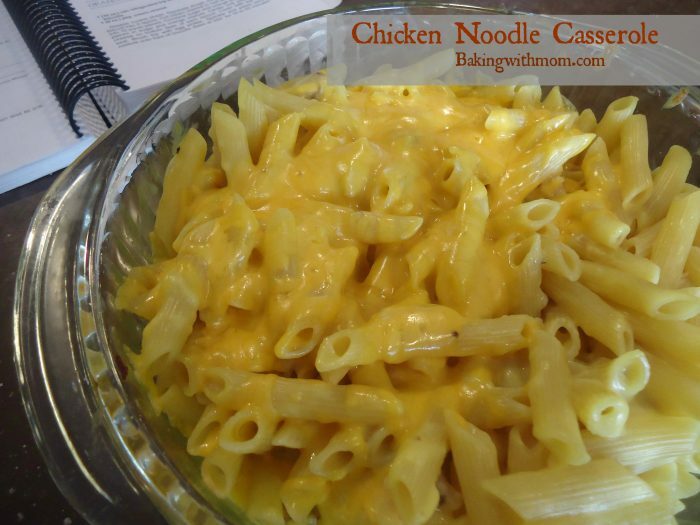 After the noodles are cooked, put them in a greased 9×13 pan. Add the cooked hamburger and tomato soup. Sprinkle cheese on top. So a few meals were made from an $8 9×13 pan. Not too bad for a meal with meat in it. 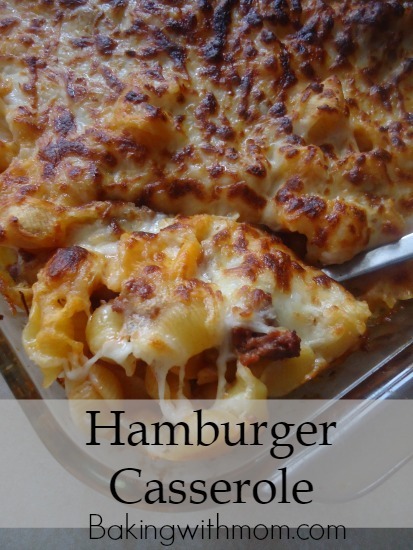 You can pair this hamburger casserole with some 30 minute dinner rolls. 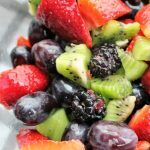 Poppy Seed Fruit Salad would be easy to make as well. It was a complete meal. 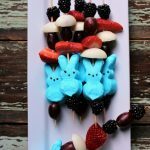 Did I mention the kiddos loved it too? Such a total win. 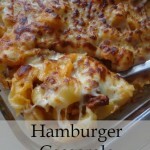 This hamburger casserole is a hit at my house. 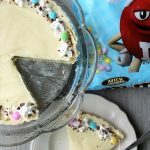 Uses only four ingredients so it is a simple recipe to put together. Pour noodles in a greased 9x13 baking dish. Need Another Family Friendly and EASY Meal? the tomato soup – do you mean the condensed kind? Yes, I do! Just regular tomato soup. We had this meal tonight…it’s so good! Hope your family liked it! It is a favorite around here!! It sounds like a great recipe but I am not sure what you mean in 1 box shells. What type shells and what size? It is pasta shells, a one pound box. Actually, you can use any shape of pasta you would like. Rigatoni, elbow macaroni, etc… hope this helps! So basic , so tasty ! Definitely a keeper ! I am so glad you like it! It is a favorite here! !